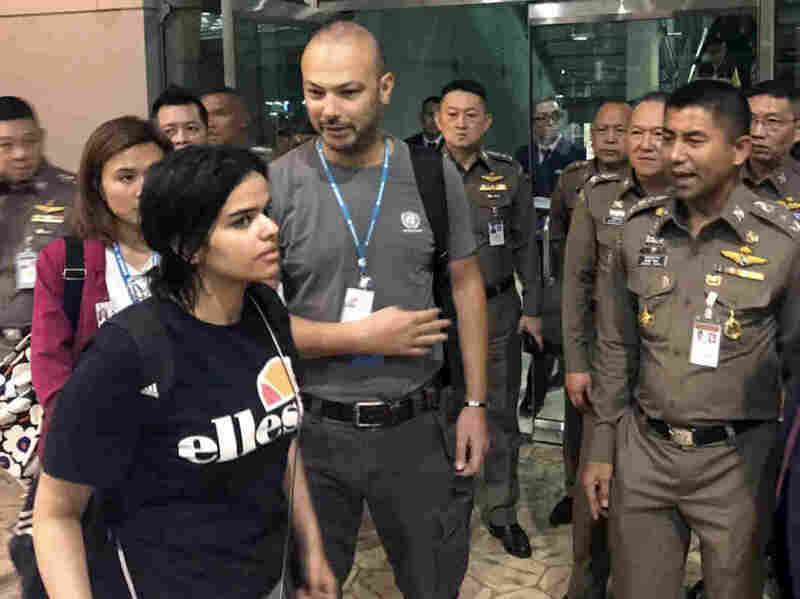 Saudi Woman Granted Refugee Status, Could Get Asylum In Australia Rahaf Mohammed Alqunun fled her family during an overseas trip and tried to fly to Australia, but was stopped in Thailand. The U.N. refugee committee has declared her a refugee. "I'm happy," she says. Saudi woman Rahaf Mohammed Alqunun walks by Thai Chief of Immigration Police Maj. Gen. Surachate Hakparn (right) before leaving the Suvarnabhumi Airport in Bangkok. Australia says it is considering granting refugee resettlement to the Saudi, who fled from her family, based on referral by the U.N. The young Saudi woman who captivated the world with her harrowing tweets claiming abuse has been granted refugee status by the United Nations. "The UNHCR has referred Ms Rahaf Mohammed Al-Qunun to Australia for consideration for refugee resettlement," the Australia Department of Home Affairs told NPR in a statement, referring to the office of the U.N. High Commissioner for Refugees. Australia will "consider this referral in the usual way, as it does with all UNHCR referrals." Alqunun's story is anything but usual. The 18-year-old captured the world's attention in a series of Twitter posts that at times read like an international thriller — with very real consequences. Alqunun's family was abusive, she said, even more so since she had renounced Islam. So while on vacation in Kuwait, Alqunun slipped away from her family and tried to fly to Australia through Thailand. Alqunun was stopped at the Thai airport by Saudi officials, who confiscated her passport and booked her on a flight back to Saudi Arabia. But Alqunun barricaded herself in her airport hotel room. With the help of friends in Australia, Sweden and Canada — who tweeted on her behalf while she slept — her newly formed Twitter account served as a nonstop plea to Western countries to grant her asylum. So far, her family members don't appear to have commented publicly on the allegations of abuse. However, The Associated Press cited Thailand Immigration Police chief Maj. Gen. Surachate Hakparn as saying that Alqunun's father denied the narrative put forth by his daughter. The AP reports that according to Surachate, Alqunun's father said he did not physically abuse her or try to marry her off against her will as she alleged. "He said the daughter might feel neglected sometimes," Surachate said. "But he didn't go into detail." She is one of 10 children, the immigration police chief said. Alqunun has refused to meet with her father, who arrived in Bangkok on Tuesday. She said she was scared after receiving word of his arrival. "The Australian government is pleased that Ms Rahaf Mohammed Al-Qunun is having her claim for protection assessed by the UNHCR," a spokesperson for Australia's Department of Home Affairs told NPR on Tuesday. Australian officials have hinted that Alqunun's request is likely to succeed. "If she is found to be a refugee, then we will give very, very, very serious consideration to a humanitarian visa," Australian Health Minister Greg Hunt told the Australian Broadcasting Network before her refugee status was made public, according to the BBC. "Mark my words," said journalist Mona Eltahawy, who writes about the intersection of Islam and feminism. Alqunun "is going to start a revolution in Saudi Arabia. Go on social media now and watch accounts of so many young Saudis saying, 'Rahaf, you've shown us that we can do this! Rahaf, you have shown us that we deserve to be free.' "